Maritime Unions have met in Auckland, New Zealand, to work towards a Regional Maritime Federation to build union strength throughout the South Pacific. 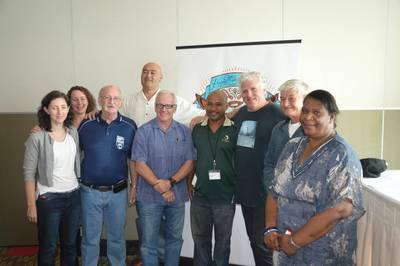 The meeting brought together the Maritime Union of Australia (MUA), the Maritime Union of New Zealand (MUNZ), the Papua New Guinea Maritime and Transport Workers Union (MTWU), the Australian Maritime Officers Union (AMOU) and the Merchant Service Guild (MSG). All are affiliates of the International Transport Workers' Federation (ITF). ITF president and national secretary of the Maritime Union of Australia Paddy Crumlin said the purpose and focus of the federation is to strengthen the capacity of the unions in the transport sector to effectively represent the interests of their members, as well as to increase the capacity of the union movement in the region. Crumlin said it was a positive development to have a number of observer unions present at the meeting who played important roles in the maritime industry. "What we are seeking to do is form a Regional Maritime Federation with a real structure that is accountable, with proper rules, so we can sit with employers in the region and talk about how we can deliver productivity and safety," Crumlin said. "There are many areas of common interest we are working on, including the growing offshore resources sector and the fisheries sector."